What came out was a Band Saw Bird House Box. You know the BSBHB. Since I never put anything into my boxes maybe it can have another use. So here it is. Still needs a little more finish but since I brought it in the house to show Kathy, might as well put it on LJ. 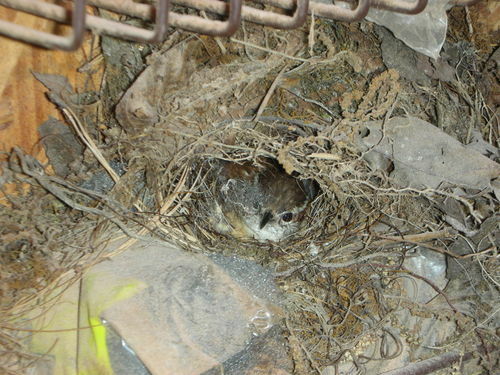 Already got a Wren’s nest in a pack of steel wool on a shelf (last picture). They come and go and we have 3 eggs waiting to hatch in a couple of weeks. This is right over my big belt sander and the noise doesn’t scare them. I’ve been working there and had them land on my shoulder while traveling back and forth with nest materials. We’ve had them nest in the greenhouse and in hanging baskets but this is a first. Ralph, quick update on the bird part of the story. We now have 4 eggs and according to my bro-in-law (who has a PhD in Birdology,,,,no way I can spell Ornitho-whatever) should have hatchlings in 10-14 days. We’re gonna put out meal worms for the parents to feed with. They won’t have to look so hard for food. Can you make a John Deere Toy Box Tractor….I got an almost 1 year old great grandson having a birthday in late June and he is a green and yellow nut? That is a great design for a birdhouse that would be easy to check on the eggs/babies and to clean out. I am going to steal this idea for my bluebirds. Those wrens are the most prolific nest builders I’ve ever seen. My wife left her purse on the hood of her truck one afternoon in the garage and the next morning there was a wren nest in it! Very Nice Work Indeed! Thanks For Posting! Cool bird house and pls keep us updated on the status of the eggs. If you have a pic of a bird sitting on your shoulder, that would be neat to see. Checked our bird this morning and she’s sitting on 5 eggs now. I think they will wish they had built a bigger nest. They may have to build on a nursery. She pretty cramped sitting on 5 eggs and when they hatch that’s gonna be a crowded nest. They still come and go like normal even though I was on the band saw and belt sander most of the day in front of the nest. She didn’t even mind me taking pictures. 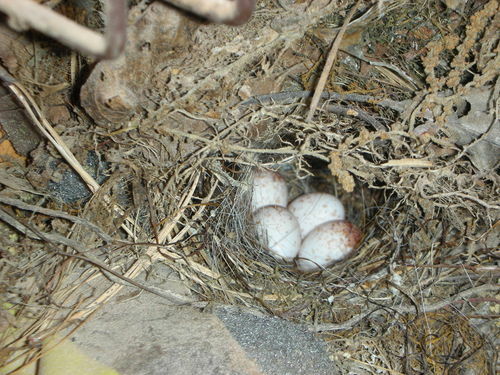 My brother-in-law (the bird guy) told me that Wrens often line their nest with spider egg cases. That way when the spiders hatch they will feed on the mites that birds always have. Pretty smart, huh? Eggs will start to hatch in about 10 days. I’ll let you know. Very cool information. I didn’t know that about the spiders and mites.